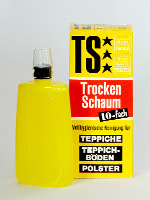 People who appreciate high quality garments naturally cherish an adequate washing care product as well. There is no sense in spending lots of money on designer brand name clothes only to ruin them in return by using a cheap detergent. Appropriate washing care for sensitve fabrics! Erich Rindt realized already 50 years ago that most garments don’t need to be taken to the dry-cleaner´s. Washing them yourself is a much better choice, especially when using the right kind of detergent. Different types of fibres mean different requirements! The company started out with impregnating agents, carpet care, and special care products for curtains. 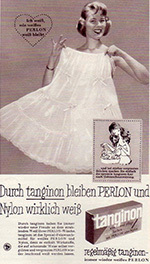 In 1978 these were followed by a new silk detergent called ‘tenestar’ which is still popular today. tenemoll, a washing care for cashmere wool, was launched in 1983 and has become so popular that manufacturers such as Iris von Arnim Cashmere in Hamburg, Ludwig Beck in Munich, or Fedeli Cashmere in Italy are having it produced by us with their private label. Our philosophy states that every fibre is individual and therefore requires its own demands from a washing detergent. This is why we have been extending our product range over the past years focussing on special purposes. Environmentally friendly – not just in the opinion of Ökotest, a leading German magazine. All detergents may be used both for sink and machine washes. We have always laid special focus on the ecologic aspect. This means that all of our liquid detergents are produced without phosphates. The preservation process does not involve formaldehyde or catoen, both of which are harmful to the environment. Instead, we use potassium sorbate, recommended as a preservative by Ökotest-magazine. The INTERVALL product line is readily biodegradable (OECD-screening-test). The consequent focus on the environment was being accredited when Ökotest-magazine rated the INTERVALL careproduct line as “recommendable” in 1993. As a special courtesy to people who are prone to allergies, INTERVALL GmbH also offers their product line as an unfragranced version. Our products for all types of fibres! A product line as comprehensive as this is rather unique. The INTERVALL care product line is just like a complete cosmetics product line – but in this case for tender dresses, soft sweaters, sensitive underwear, sportive t-shirts, and white day and night lingerie. Only a small, but stable, family-run company like INTERVALL GmbH with many years of experience is able to offer such a service. We are able to adapt it in order to meet the needs of our customers and their garments. You will find that a bottle of Tenemoll, suitable for wool, cashmere, and downs, costs considerably more than standard detergents you can buy in the supermarket. In return, it is much more efficient. In addition, you don’t need to be concerned about harming the environment. And what do a few euros mean if we are talking about your 400 € cashmere sweater or your 800 € silk dress? This consideration caused leading fashion brands such as Bogner and Strenesse as well as lingerie and beachwear brands such as Lingerie Louis Féraud, Maryan Beachwear, and Zimmerli to recommend using the INTERVALL care product line. Iris von Arnim Cashmere, Closed, and Maryan Beachwear make use of a very special service: they provide retailers with the care products tenemoll and teneplus using their private label. This indicates offering a perfect service while preventing complaints due to incorrect washing treatment. Please bear in mind that the INTERVALL care product line is only available at special retailers – not in the supermarket! 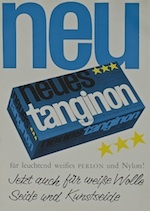 More than 50 years - new tanginon for bright white PERLON and nylon. In the magazine Film und Frau No.9 1957. 50 years ago, our first product for carpet care.